So it ended, as have most of the recent UN conferences on climate change, with a statement of platitudes and good intentions but nothing in the way of firm commitments to action. George Monbiot called the conference text 283 paragraphs of fluff, The Economist called the outcome “a limp agreement” and “a poor result for a summit billed by some as a “once in a generation” chance to save the planet from its intolerable burden.” Despite warnings of ecological tipping points looming, and the world’s top scientific organisations urging action on population and consumption, the leaders of the world (or at least, the ones who could be bothered to turn up) managed only to boot the ball downfield about as effectively as an English footballer in a penalty shoot out. It was all just too difficult. So they left it for another day — perhaps another generation — to sort out. It’s easy to point the finger of blame. The United Nations is ineffectual at best1, hamstrung because it can only go as fast as a consensus of its member nations will allow — and the perverse interaction of perceived national interests with multinational corporate desires means that no-one is going anywhere fast. So where do we go from here? It’s tempting to answer “to hell, in a hand basket”, and get on with planting the vegetable garden2. Personal, familial and local sustainability are achievable without needing the permission of the United States government, Hu Jintao or Charles and David Koch. We can all build our little local lifeboats. We can also aspire to building a national lifeboat. We can work from the bottom up, instead of from the top down. If politicians and diplomats can’t do what’s needed, then we can do it ourselves — and in the process ditch the politicians who won’t and elect ones who will. But is “bottom up” action enough to get us out of trouble? There are encouraging signs that it might be. Earlier today, as I was mulling over my reaction to the Rio failure, my attention was drawn to a new paper in Nature Climate Change titled Bridging the greenhouse-gas emissions gap by Kornelis Blok, Niklas Höhne, Kees van der Leun and Nicholas Harrison. The authors propose 21 “wedges” — actions which may in themselves be small, but can be done because they are directly beneficial without reference to emissions, and which will when taken together give us a chance to bridge the gap between current national and international commitments on emissions reductions and the emissions levels required to enable to the world to stay within two degrees of warming. Rather charmingly, they call their approach “wedging the gap”. Action by an individual citizen, a municipality or even a large multinational company may be considered ‘a drop in the ocean’. Even individual actions by large companies or big cities will rarely have an impact of more than a few megatonnes of carbon dioxide equivalent. However, being part of a larger coalition that has the potential to completely bridge the entire emissions gap will make it much more attractive to participate in and take action. To this end, it is necessary that globally leading organizations in the world of business, governments and non-governmental organizations (NGOs) participate. They need to be part of a coalition that together provides leadership in bridging the gap. Therefore, the key to the success of the wedging-the-gap approach is forming and sustaining this coalition. Emission-reduction pledges of countries under the UNFCCC and ‘bottom up’ initiatives by players other than national governments reinforce each other. Both have the objective to eventually bridge the emissions gap, but from two different angles. Ultimately, the objective is to close this gap, and both sides are essential. In other words, we need both bottom up and top down approaches to climate and sustainability. And if we set about preparing the individual foundations well, then we may just create an environment that enables the people working on the top floor to focus on what’s needed, and not on what their paymasters want. This looks good to me. The 21 initiatives are all sensible, achievable and provide a work programme that you can readily get involved in and measure progress against. The paper even identifies which organisations are already in place to take the lead on some of the initiatives. Best of all, no need for navel gazing or discussion about how to craft the message to appeal to the indifferent, deniers etc. The good thing about this approach is that it is working with the market and within the current system to achieve the goals. None of this ‘pie in the sky’ vision of changing paradigms and overthrowing the current power structures. I’d suggest this more mature approach will have mre success than all of the politically motivated environmentalism advocated by many on here. Gosman: please, that’s a straw man. Refer to comment policy, please. Not a strawman. It goes to the heart of the argument I have made here numerous times. You have to work within the system rather than moaning about how the system is so unfair. That is what is so pleasing about the approach suggested in that paper you linked to. Sorry Gosman systems are created by people. Systems have a limited life. They are changed over time. We must work both within the system which is unavoidable but also work on the system. Systems drive behaviour so the best way to change behaviour is to change systems. I respectfully disagree y-not. Market behaviour is reflective of basic human nature. It is why Communism failed in the former Soviet bloc and China pre 1980’s and will continue to do so. If your theory held up the system in place in those countries for multiple decades would have changed human behaviour. Yet when they reverted back to a more market orientated approach the behaviour of the society was pretty much identical to what it is in countries that had not had the artifical man made system imposed on it. Fascinating though this topic may be to you, it is off-topic here. The suggestions you linked to are all about making incremental changes working with current systems at a micro level as opposed to major system changes at a multi-lateral level. Personally I think what is being discussed is very pertinent to that point. However it is your blog so if you so desire to restrict the debate to a particular narrow definition of topics it is obviously your right to do so and I’ll respect that view. Gosman: “The system” is adapting to new challenges all the time. We make law changes such as anti-smoking laws or pass environmental protection laws when required. “The system” when left to its own devices without political leadership will not optimize the well being of the people but the profit opportunities of the powerful corporations within the system. As an example: without political leadership and without anti-smoking laws countless more people would die from smoking induced illnesses while the tobacco industry would gleefully spread the dangerous habit to the young and the vulnerable to get them hooked too. If we had no anti-drug laws the drug pushers would run wild lining their pockets even more with the death and destruction they cause to others. With AGW the matter is much more serious. While smoking or drug use is a voluntary harmful action, every human being on the planet is affected by the trajectory of our future climate without much personal choice in the matter unless we all act cooperatively. The only way humanity can avoid the catastrophes predicted by climate science is by multi-lateral binding agreements that are negotiated on the political arena. Your constant references to communism are a sad old straw man argument! Nobody wants to revisit Stalinist times of any description! The nonsensical spin you regurgitate here that environmentalists want to bring about a communist revolution is nothing but scaremongering that has been dished up by right wing circles as a powerful verbal attack tactic to divide the public and to discredit the actual argument we are debating here. The international process such as the Rio meeting are at the moment our best hope to achieve the political changes we need to undertake that will allow us to tackle AGW in a meaningful manner. Which catastrophes predicted by climate science? I looked through the ippc literature and couldn’t find it. I have also read various mainstream IPCC authors that do not believe in catastrophe. We have been there and discussed that and I linked you the outlook description of a 4 Degree warmer world. In any sane persons book, that is catastrophic in its consequences and unless we change our path it is increasingly likely to happen for our descendants in a century. While I’d hate to distract anyone from the Gosman and andy and their Invincible Army Of Strawmen show, here’s David Suzuki on Rio + 20. Bill, thanks for the link to the compelling Suzuki interview. A splendid statement from him. While I’m on the thread I’ll add a link to The Climate Group take on bottom up activity. They talk of the diplomatic process being more likely to work as a “retrospective wrapper for international environmental, sustainability or climate cooperation” than by creating the system itself from the top down. But, while I have no doubt of the capacity of civil society to cooperate across national boundaries, the problem is the world is actually owned and run by other forces: currently, Big Stupid. Civil Society can only make changes where it counts – the industrial process – with the consent of the governers, and, not least thanks to the Idiot Revolution that has run essentially unhindered – despite its continual and manifest failings – from ’79 to date, that consent is extremely difficult to obtain indeed. This Big Stupid you refer to will be the same Big Stupid that will be running the show after the “transition to a low carbon economy”. No, it won’t. That’s the point. Big Stupid has to be pushed aside by the Non-Idiot Capitalists. Big Stupid may well stay on in a figurehead capacity, or they’ll use their grotesquely distorted economic advantage to buy up Non-Idiot technologies and proclaim them as their own – and they will, of course, cheerfully continue to profit-bludge, as ever – but it’s the Non-Idiots that will have created those profits, and they will be the ones actually running the Non-Idiot revolution. Many of the new forces will, of course, be Chinese, not least because the unholy alliance between Big Stupid and Just Plain Stupid in the West ensures our falling further and further behind in the Non-Idiot race. Well done you, andy! And, how topical! – Climate Crocks on the wind industry. Where is your proof AndyS that there will be no catastrophe forthcoming? Based on what evidence? If you can put together some compelling arguments, maybe then we can all think about getting some sleep. Do you believe disaster can be averted by a twist of logic? I don’t have any proof that there will be no climate catastrophe: it is a matter of probabilities and risk management. Similarly, I don’t have any proof that the Earth won’t be impacted by a huge meteorite in the next week. Jolly good Bill, you’ve got your little book. How charming. The IPCC are not guilty directly of extremism. The WWF and Greenpeace are, however, and they have a lot of input into WG2 and 3. OK, fair enough. How about just explaining how you go about assessing the issue on the basis of probabilities. I am not a betting man but I would be prepared to take a chance if you can explain how you reach your conclusion on the odds. If someone had good reason to bet on a certain horse I’d be game enough to take a punt. Explain why you think the odds are stacked in favour of “no catastrophe to be expected”. Just remember if you are wrong that the consequences are quite severe. Incidentally we have policy at the hospital on risk management with a scoring system. Even if the probability is low <1%, if the consequences are severe e.g. someone is accidentally jabbed with an HIV infection, then the score balloons so high that preventative policies become paramount. There is no second thought by management. Similarly, the effects of climate change could potentially be quite severe, worst case scenario, mass extinctions. I would argue that under the guidelines of our risk management policy, the score would be off the chart. 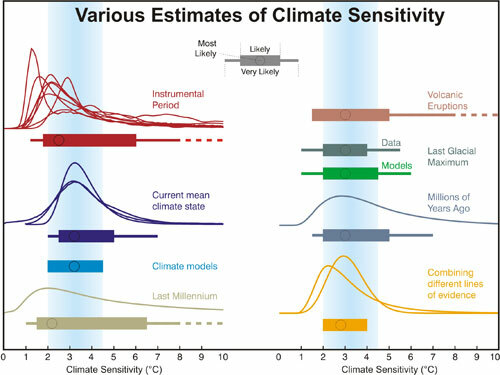 The probability distribution graph for climate sensitivity would be a place to start. Then you’d have to determine at what point a “catastophe” is defined. And why exactly is there little evidence that this has any basis? How does one go about acquiring the necessary information, before it becomes unequivocal? Science is a wonderful thing, lets now apply the full repertoire of scientific tools to address the issue. Any thoughts on how this could be done, then we can resolve the issue once and for all and no need for further discussion on HT. Most climate scientists* do not subscribe to the 2 degrees “Dangerous Climate Change” meme (I know I don’t). “Dangerous” is a value judgement, and the relationship between any particular level of global mean temperature rise and impacts on society are fraught with uncertainties, including the nature of regional climate responses and the vulnerability/resilience of society. So if we can detach the emotion from the logic, it appears that at least one (and he claims many) “mainstream” climate scientists do not subscribe to the two-degrees = dangerous meme. OK, now Bill is reaching for his book of links – contempt, hatred etc. OK so I fly off the handle and have a short fuse OK? It is a personality fault I have – I accept that. Many times I post stuff that I regret. Sorry. Again, I would like to stress that just because 2 degrees might not be dangerous doesn’t mean we shouldn’t manage the risk., In my view we should do something that entails achievable goals, which currently, I feel, we are lacking. The essential point is that 2ºC is arbitrary. There are certainly damaging impacts below that level, and there may also be tipping points that commit aspects of the system to considerable change – Arctic sea ice loss being a good example, because it’s already well under way. 2ºC is a legislator’s rule of thumb. They seem quite happy to pay lip service to it, while merrily doing little or nothing. My gut feeling is that 2ºCis already in the rear view mirror, and we’re heading for 3ºC plus. Totally agree. Hardly a day goes by without some new finding indicating that the 2007 conclusions/projections were way too conservative. Not that you can blame the authors – that was the best evidence they had at their disposal. The sad fact is that unlike Christchurch house valuations the official last word has to remain at 2007 “prices” until the next evaluation. If I can add one further point to this discussion of risk management. If I can use human disease as an analogy. Why would you judge the expected clinical risk of a patient by monitoring their temperature, blood pressure etc which may not give the fulll clinical picture. Surely the best approach is to draw from the experience of other patients who have experienced the same symptoms. In the case of climate change, all we have is the paleoclimate record. Unfortunately the experts who have been unravelling what the fossils tell us, are saying that warming has coincided with doom many times in the past. We are surpassing the rate of CO2 increase relative to the PTM by an order of magnitude. That doesn’t fill me with confidence that all will be roses. The second point is that we only have one roll of the dice to get it right. Wouldn’t it be best to place your bets on the safest level of GHGs i.e. within the range that has been with us for the last 10000 years. We know with a high degree of certainty that living conditions on earth will be stable when GHGs are in this range. WIth regard your second point. how much can we realistically do, I’m sure we can a lot more. I see my investment account is returning 3.25% interest and after tax that will be 2. something. If I buy solar PVs, I expect that the return on them will now far exceed what I can get from the bank. I am still searching for the best deal on PVs but the price has really dropped, and the materials are in no way limiting. If we look at petroleum, it is costing us a fortune to import, and making the Arabs rich, I don’t see this helping the poor. In Nigeria, the oil industry profits and a few government officials, but the poor aren’t benefiting, I suspect that many will be enduring the pollution that comes from drilling to boot. With PVs we can make our own energy for years and make a profit that needn’t go off shore. Have you considered where the materials for your PV panels come from? Do you know which rare earth metals are required and where they come from? I agree about the importation of petrol. That is why shale gas is such an attractive proposition. I haven’t decided which system to run with yet, but I am interested to hear from others. My understanding is that amorphous silicon, although less efficient per sq meter, is much cheaper to produce and buy and requires less resources ~US$0.60 per watt cost price. It is also more efficient in cloud, and doesn’t need direct line of sun as much as monocrystalline, and polycrystalline systems. I have a ton of roof space, so I don’t need super efficiency. But I would be interested in what others think. Tony the best is to go by price/W on your panels. The most panels are either mono-crystaline or ploy-crystaline. Amorphous panels have a lower efficiency and require more roof space. Check out http://www.whatpowercrisis.co.nz for an example of deals to have. They offer 2KW grid tie systems installed for $9995 inc. GST which is a fantastic price. As far as Andy’s disinformation campaign goes, don’t worry. The Silicone panels are made of – well – silicone sand with small amounts of Phosphorus and Boron. No rare Earth elements in sight. The frames are Aluminum. The energy payback time of Solar PV is about 2 to 4 years with a panel manufacturers warranty normally of 25 years. Such a long warranty is rather unique among industrial produced goods. So I can only encourage you to look further into Solar PV. At the current cost of a grid tie system your pay back in form of power cost savings is considerably better than the interest you would get at the bank for the same amount. All of them have “long tails” out to 6ºC. Most likely may well be 3ºC or just under, but we can’t exclude higher sensitivities. In other words, there is a small but finite risk of large temperature increases. I think it’s fair to describe a 6ºC increase as “catastrophic”. The balance of the evidence does not allow us to exclude that possibility, so, like Tony’s hospital, we should be prepared to take steps to avoid the possibility. The possibility of a meteor strike is something that many people take seriously, and a fair amount of effort is being put into surveys and research to determine the paths of earth-crossing objects and methods of changing their orbits. If he is sooo concerned about world poverty then I invite him to read a excellent book addressing this very topic. It’s called the “Globalization and World Poverty” by Michel Chossudovsky (born 1946) who is a Canadian economist. He is professor of economics (emeritus) at the University of Ottawa. Chossudovsky has been a visiting professor internationally, and has been an advisor to governments of developing countries. In 1999, Chossudovsky joined the Transnational Foundation for Peace and Future Research as an adviser. Chossudovsky is a signatory of the Kuala Lumpur declaration to criminalize war. He is the author of The Globalization of Poverty and The New World Order (2003) and America’s “War on Terrorism” (2005) and Towards a World War III Scenario: The Dangers of Nuclear War (2011). Unfortunately for andy – none of what the author writes will provide him with any comfort. There is also a very pertinent chapter on addressing AGW and the cost of NOT doing so. But as the obvious conclusions are not palliatable to the neo-liberal doctrine that andy holds so dear, I doubt if he will take up the challenge. andy – a maths graduate I’m led to believe – thinks that a p < 0.5 is a likely outcome! Obviously a statistics paper was NOT in his course. Ok, Macro. I have looked at the probability of a workman falling off a ladder and having an accident, and decided that this is an unacceptable risk, therefore we need to ban working on ladders. I have looked at the probability of getting killed driving a car and decided that this is an unacceptable risk, therefore we need to ban driving cars. I have also decided that emitting CO2 is an unacceptable risk, therefore I have decided to stop all fossil fuel extraction and move to biofuels. In order to do this, I will force African villagers off their land at gunpoint, clear fell the rainforests, and grow corn for biodiesel so that I may feel good why I drop Tabitha at montessori in my bio-fuel powered BMW. Stop erecting straw men, please, and argue in good faith. Given your stated contempt for those who read this blog, you’re lucky I passed this comment at all. The problem Andy is that the workman on the ladder can take responsibility for his own actions and life. His actions only matter to him and your analogy is utter tosh. The global climate however is a matter that will affect everybody. And billions of people already living at the very minimum of food and essentials for life will be the most affected by the early stages of the climate catastrophe unless we decisively preempt its arrival. Your stance at denying not only the overwhelming evidence but also all reasonable means of mitigation is utterly arrogant and indefensible. You know you are arguing form a totally lost position. And while you might think yourself smug to ensnare people on the net in circular arguments (repeating as fact statement that have been proven to you as complete nonsense many time over) you are simply digging a bigger hole for yourself. I am already leading a fairly austere lifestyle with a fairly good income. Emissions reduction strategies will affect me much less than most people on the planet. What a load of arid nonsense you talk andy! Thanks for the school kid links. Actually I didnt really like stats at university, but I have bought Matt Briggs book to brush upmon Bayesian theory. Saving it for the rainy weekend though. Q. How many Rio+20 negotiators does it take to change a light bulb? A. I am sorry but the negotiators cannot possibly spare any time to change any light bulbs as they are still debating whether the verb in the light bulb communique is to be ‘exhort’ or ‘commit’ or ‘encourage’ or ‘promote’ changing the light bulb. Apologies to How Many Rio+20 Negotiators to Change a Planet?.